A good friend was recently complaining about his tax. With HECS, and now the carbon tax, there was no way he was going to get a tax refund. In fact, after checking the government’s carbon tax calculator he was worried he’d have to make an extra tax payment. I was confused by his worry until I realised that he thought the carbon tax was an extra item on his tax return, like HECS is. So this article endeavours to explain how it works. Please note, it is not a criticism, commentary or political opinion article! 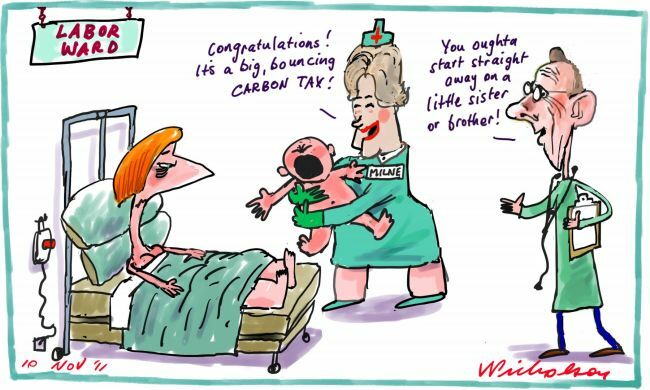 The carbon tax came onto affect on 1 July 2012. A tax of $23 per tonne of CO2 emissions is charged to the largest polluters in Australia – there are 293 of them (you can see a list here). These are the only companies or entities that will get a ‘carbon tax bill’. Of course, this extra tax is likely to increase their cost of production, so it’s more expensive for them to make the products they make or provide the services they offer. As is normal in the business world, they are likely to pass on the extra cost to their customers. This is where the general public of Australia is likely to feel the carbon tax pinch – normal products we use every day may be come more expensive. But we have the choice whether to still use those products or find an alternative that pollutes less in the making and so costs less. For example, in the olden days, before the carbon tax, taking the green energy option from your electricity supplier was generally more expensive than the ‘normal’ coal-fired electricity option. But the carbon tax means the ‘normal’ electricity costs more to produce so it should now cost about the same as the green option to consumers. Or you might choose a hand-knitted cardigan instead of one manufactured on an electric knitting machine. Or maybe you choose the locally grown kiwi fruit when they’re in season, rather than those shipped in from Italy when they’re not. The idea is that if you could have the green option without it costing you less, why wouldn’t you?! Theoretically if you change your choices you can avoid the carbon tax. There are a number of household assistance packages from the government as well as changes to the income tax thresholds that are intended to minimise the impact on end users. You can estimate how you will be financially impacted by the carbon tax here. Suggars & Associates aren’t tax advisers so we can’t give you personal tax advice but we do know a number of great professionals we can introduce you to if you need tax assistance.